Andy’s puzzles routinely feature a smattering of Things I Don’t Know. It’s a weird kind of challenging, to have a mostly easy time of it, and then hit some proper noun bit, or arcane vocab bit, that causes the whole area around it to become quite tough. This is all to say that this puzzle felt like Tuesday meets Saturday, with lots of gimmes (EVANDER, GREEN TEA, SKEE, I TRY, BUSCH, etc.) helping me cruise through some sections, and then a few unknowns that required tons of (if not all of the) crosses to bring down. 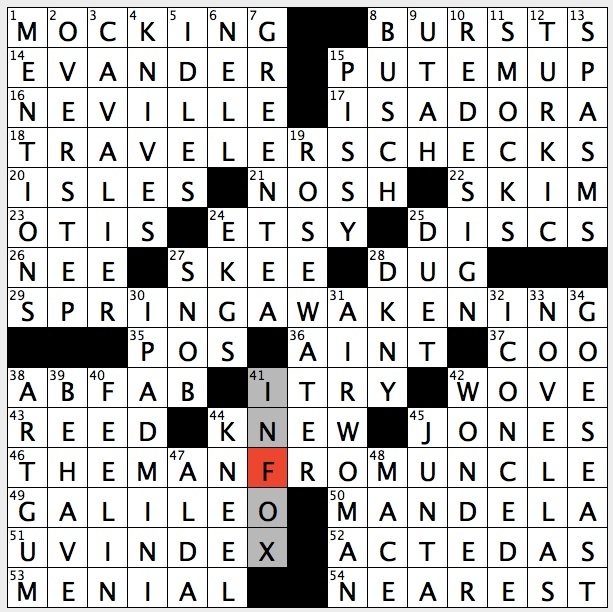 Always embarrassing never to have heard of a crossword’s marquee answer, and “SPRING AWAKENING” means almost nothing to me. It rings a bell somewhere, but I don’t know where. So that, and then DUET, were ??? to me. But the big WTF of the day was INFOX (41D: The “diddly” in “Wel-diddly-elcome,” for example), a word I’ve never seen or heard of in my life. Wait … I’m looking it up now, and it appears not to exist. INFO X? In FOX? Whoa … I’m confused. OK … apparently it’s INFIX and my computer accepted INFOX … why? I have no idea. Maybe I imagined it. Anyway, I’ve never heard of INFIX either. GALILEI, eh? (49A: Name on Pisa’s airport) Wow. I don’t know what to say. That was just impossible for me. I think that crossing is a real problem. I hope that this is not just an argument from personal failure. INFIX is not a common word at all. And who’s going to think GALILEI over GALILEO without being Clearly forced to? There was one really great, Saturday-ish aha moment in this puzzle, where two very good but tough clues cross one another. Specifically CAVALIER (3D: Love, for one), and ISLES (20A: Mankind?). Toughness through misdirection crossed with toughness through insanely brilliant misdirection. Amazing. (for the record, the Love involved is basketball player Kevin Love of the Cleveland CAVALIERs, and the “Man” of [Mankind?] is the Isle of Man). INF(O/I)X strikes me as pretty inferrable, but i think i learned it in a class in 9th grade, so idk.